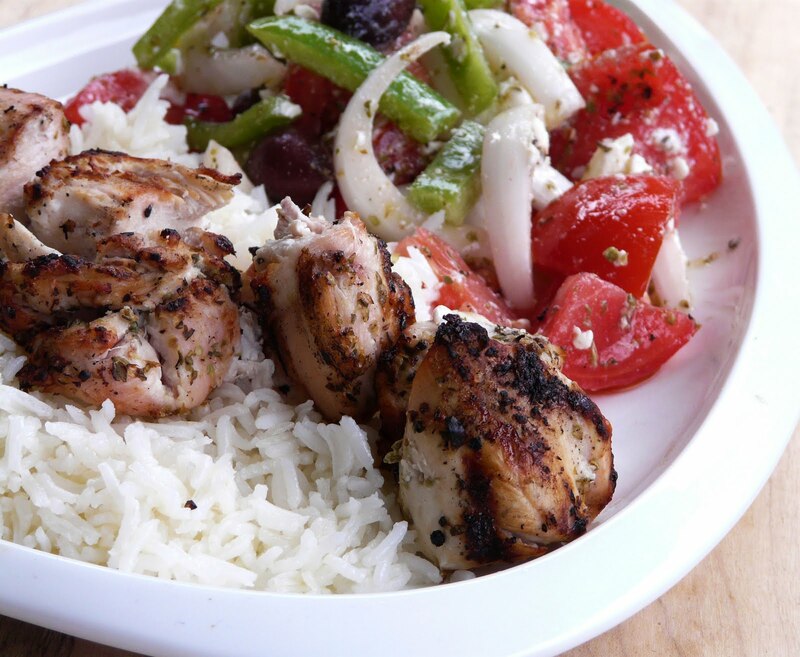 Greek is one of my favourite cuisines and Chicken Souvlaki one of my favourite meals. It qualifies as a 'work night dinner' because it comes together very quickly. First thing I do when I get home from work is to cut up boneless chicken breasts and thread on to skewers. The chicken is rubbed with fresh minced garlic and seasoned with salt, pepper and oregano and the juice of a whole lemon. Next I put a large pot of salted water on to boil for the rice and while I'm waiting for it to come to a boil I make the salad. Once the rice is cooking, the next thing up is to preheat the grill. 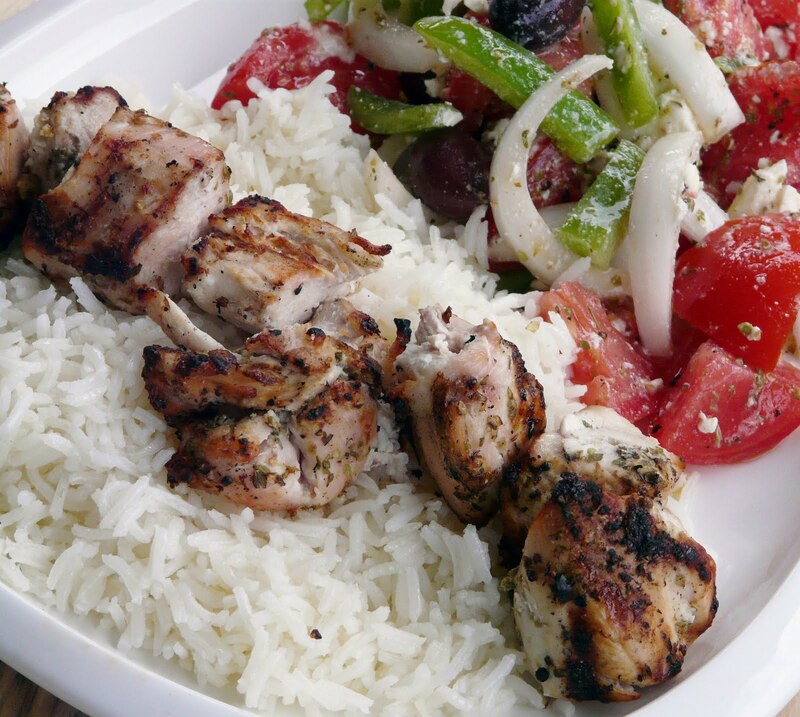 The souvlaki doesn't go on the grill until the rice is cooked. Once the chicken goes on the grill it is only a matter of minutes before dinner is ready to serve. Greek Salad is one of the few salads that I actually like. And I like it light on cucumbers and heavy on tomatoes. Olive oil over a thick slice of feta, sprinkle with herbs and bake in the oven until the cheese is hot and starting to melt then, place on top of your salad. YUMMO!!! 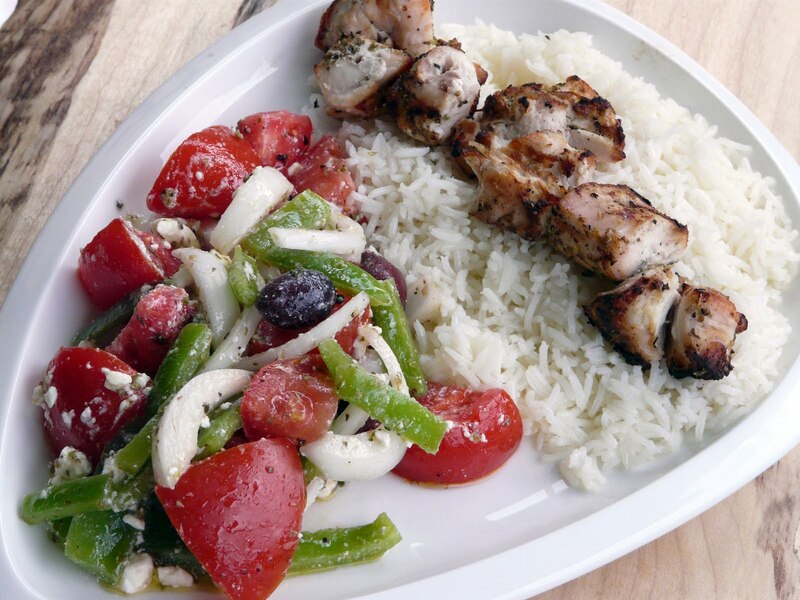 My favorite Greek meal!! Used to eat this almost every day in Montreal!!! One of my favorite things in the world Ann...looks delicious! Yummy! I'm happy that Greek is part of the melting pot of cuisines we have in this country.Love a good souvlakia and salad combo. Just wanted to let you know that I enjoy you blog. I made a Greek salad and grilled shrimp last night. Next time I'll do chicken. Would you say about five minutes a side on the grill? Backroadjournal, it will depend on how big you cut the cubes of chicken, but five minutes a side is about right. 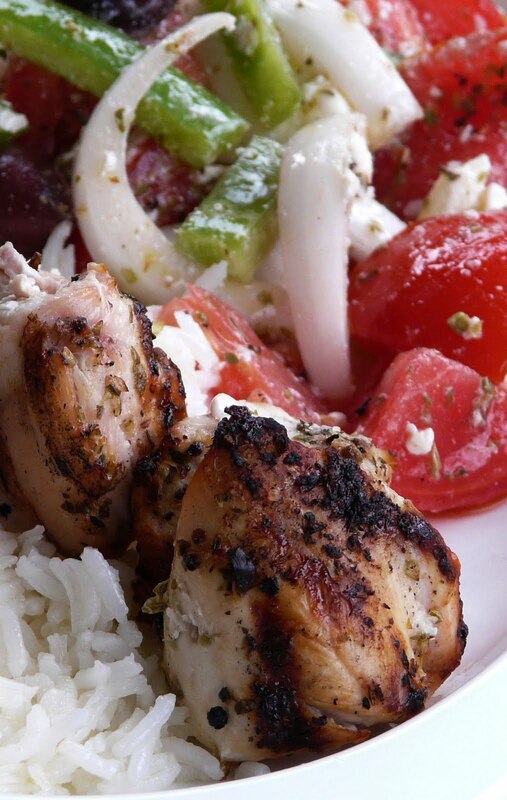 Ann - I made both the Chicken Souvlaki and the Greek Salad today. Served it with a simple focaccia with chopped green and Kalamata olives and sauteed onions on top. Lightly salted and then brushed with olive oil after coming out of the oven. It was heaven! I fed 6 people and they ALL loved it! Pat , thanks for the feedback. Glad that you and your guests enjoyed. Definitely one of our family favourites.